Peter Lely (Lugt 2092); Jonathan Richardson(Lugt 2184). Stephen Spector, New York; Peter Josten, New York; gift to NGA in 1989. Master Drawings, The Stephen Spector Collection. The Israel Museum, Jerusalem, 1969, no. 6. The Graphic Art of Federico Barocci: Selected Drawings and Prints. Cleveland Museum of Art and Yale University Art Gallery, New Haven, 1978, no. 52 (Edmund Pillsbury and Louise R. Richards). Art for the Nation, NGA, 1991, 30-31. Van Schaack, Eric. 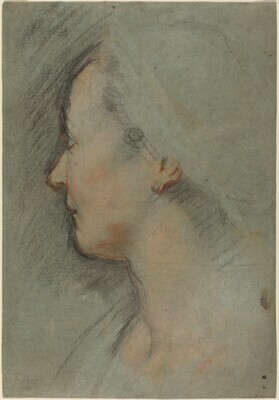 Master Drawings in Private Collections. New York, 1962: 7, 76, no. 27. Richardson, Francis. "Barocci at Cleveland & Yale." The Print Collector's Newsletter 9, no. 2 (May-June 1978): 47. Smith, Graham. Review of The Graphic Art of Federico Barocci exhibition, Pantheon 36, no. 3, 1978: 290. Byam Shaw, James. The Italian Drawings of the Frits Lugt Collection, Volume I Text. Paris, 1983: 110 (under no. 101). Burns, Thea. "Chalk or Pastel? : The Use of Colored Media in Early Drawings." The Paper Conservator: The Journal of the Institute of Paper Conservation 18 (1994): 51, fig. 4.